Here’s a few of our customer reviews, comments & photos. You could be doing this!.. Leeds Cocktail Making Class & Tapas Meal. Amazing! Thank you for organising an amazing weekend Lindsey Cummings thoroughly enjoyed herself as well as the rest of our party!!!! Manchester Cocktail Making Classes & Dreamboys. Brilliant! and all really well put together. Cocktail making was fab and the dreamboys were brilliant. York Cocktail Making Classes. FAB! Hiya it was amazing. Thank you for sorting the hen party! I’m having another due on 22 Nov in Sheffield what things can be booked in there please as will defo be using you again? Hi, I just wanted to send a quick message thanking you for a fantastic night on 21 August 2014. Both the bar and Funktion events were very accommodating with the last minute details and changes from my event; and I apologise it this caused any inconvenience. We had many out of town guests to account for. Nevertheless, the atmosphere, food and drinks were amazing and my guests appreciated the attention. I have enclosed a few photos of the night. We had a great time in Leeds, the hotel was lovely and the staff were really friendly. Was just the right place to relax in the pool before our big night out. Staff in la tasca were nice too, lovely food. We went to Yates and a few of the smaller bars, then to pryzm on the sat night, all the girls had an excellent time. My sister wanted to have her hen do all over again! Thank you for all your help, took a lot of the pressure off me! been any more entertaining and accommodating, the food was plentiful and a really good quality. I genuinely only have great things to say about that part of the day and would book this again should I organise a hen do in the future. Cocktail Making Parties Leeds – Booking Again… Can’t wait! Cocktail Making Party & Nightclub Entry Manchester – We had an amazing time !! 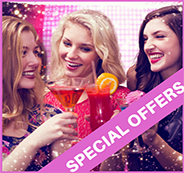 Cocktail Making Party, Meal, Dance Party, Booths & Hotel – Leeds – Amazing want to do it again!! Lincoln Cocktail Making Party & Meal. Have to do it again. Amazing!! I was looking for something special to do for my Hen-do when I stumbled across your website. Due to some of the Hen’s having a limited budget I didn’t want to go too far from home. Your Events team had the answer!! We booked the Cocktail Making Party with a 3 course meal in Lincoln. I must say, we were all amazed and impressed at how well we were looked after!! Party hosts were great fun – lots of games, challenges and cocktails. The food was simple but good quality. My gluten free Hen’s were well accommodated as were the non-drinkers in the group. We’d also booked to stay over in Lincoln – nothing was too much trouble for Jay and the team. We’d got a combination of 1 and 2 nights stay – all with a fantastic breakfast in a wonderful city centre location. Overall – a great weekend and I would highly recommend you to anyone wanting a good party!! The cocktail making in Birmingham was brilliant!!! Definitely want to do it again!!! The girl that looked after us was really good and very patient with us ha ha! Thanks for organising everything it was amazing! The cocktail making was fab and the hotel was so nice and central. Everyone loved the Leeds hen party and I will definitely recommend your company to any future brides I know. I have attached some photos. Customer service and value for money was excellent. I arranged a hen do for a friend of 26 years and decided to use Cocktail Making Parties, which I found via Google. I contacted them to get quotes on activities that I thought would be fun to ensure an excellent day for all involved. Cocktail Making Parties were very accommodating. Friendly and easy to communicate with, they gave me quotes instantly that were very reasonable and competitive with other companies. The team were very customer focused and nothing was to much trouble. If I needed to adapt my booking they made me aware of all costs before hand. I decided to take the bride to be and fellow hens cocktail making. I was slightly worried as being an older crowd how they would be able to handle their spirits! The venue available in Brighton were friendly, adapted to our needs well, gave the older ones water and put nobody under pressure. A great day was had by all and everyone phrased the organisation behind it all. After cocktail making, some a bit more red faced than others, food was provided to soak up the alcohol. The food and drinks were of a high quality and much nicer than the evening meal I had organised later on that night. I would highly recommend Cocktail Making Parties to anyone as I don’t think I would be able to find better customer service or value for money elsewhere. Loved every minute of the cocktail making Charlotte was fab and so friendly drinks were awesome, drunk on leaving. Great Birthday Party and awesome weekend we would do it all over again. Cocktail Making Parties are TOP! The event was a great success thanks. The guys who ran the session were good fun and the cocktails and food went down a treat. Thanks for all your help. I’m going along to the event you’re also organising next Thursday with my Bradford office so hope I will be an expert at cocktail making after that! We an amazing time From beginning to end, all the hens’ had an amazing time. Great value for money and loads of fun! Would definitely book again..
Three weeks before our party was to go ahead, another company cancelled the cocktail making class we had booked. We got in touch with Cocktail Making Parties to see if they could help us arrange another Venue at short notice. They were EXCELLENT! The cocktail making party was arranged at another venue, they also matched the price of the original class and threw in some canapes as well! The night was a great laugh Thanks for everything!